To a European an antique engagement ring, is something that is over 100 years old, to most Americans an antique is defined as something over 50 years old. Many times people who are looking for antique engagement rings actually ask for a 'vintage' engagement ring, when they mean an antique, because in jewelry terms vintage to most dealers means an engagement ring from the last twenty years. When people come to my shop asking for an antique engagement ring nine time out of ten they do not mean a Victorian antique, what they mostly mean either an Edwardian engagement ring from circa 1900-1915 or a Platinum and Diamond Art Deco engagement ring from the 1920's and 1930'. The earlier antique engagement rings from the Victorian period had the gemstones either completely set in yellow gold, or there was a yellow gold mount with a silver top. The reason for the silver top to the setting of an antique engagement ring, was that predominantly, an engagement ring that was all diamond; a yellow gold mount, tended to make the diamonds have a yellow tint, but when they put a silver top on the antique engagement ring mount then when the stone was set still had that bright luster and whiteness, which one expects of a diamond. 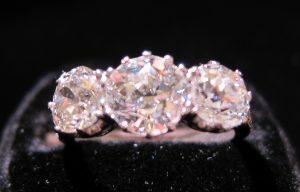 By c1900 platinum had been discovered, but was very expensive to refine; it did though have the advantage, that unlike silver topped antique engagement rings, which over a time period tend to darken due to the oxidation effect on silver, platinum however did not tarnish, and the diamonds always had that bright luster. By the mid-1900's the process for refining platinum was improved, and a lot less expensive, so you find that the entire antique engagement ring was made from platinum. 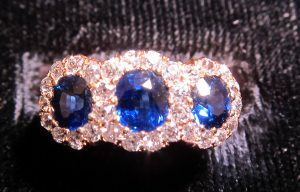 Antique engagement rings from this time period, had the mounts hand made to fit the gemstones set within. Each was an individual, and an original design, and I would recommend a to anyone looking for an engagement ring that has its own uniqueness and character, that 'one of a kindness' to look at an antique engagement ring. Someone once said that antiques are for people who know who they are, and an antique engagement ring is for someone who wants something no one else has, something that sets them apart, and is total unique for them.